and also used a variety of other methods to strengthen the model. Check out my mocpages for more information. http://mocpages.com/...hp/422162����It is a little bit of a read but I think well worth it. Quickly, the goal of this model was to make it strong enough to really utilize all the power PF XL motors provide. I think often we get caught up in complaining that they are too weak.... when actually, I think they are fairly strong, slow, but strong. I think the real problem with lack of power in some builds is simply not using the power effectively. A lot of power can get lost in bad Technic connections and /or the axles. Great crawler! Any plans for more motors? How about 4? It was interesting reading about all the mods you made. You definitely have better performance thanks to it. I'm glad that you made it clear that there isn't a lack of power in the motors but a lack of strength in the connections. I myself a nonpurist all the way I think this crawler is just beautiful. How did the 4 link suspension hold up during driving over long periods of time? Did you use the power miners wheels to get a planatary reduction ro just use thema hubs. I noticed in the video that the steering gear rack could slip on the gear, is there any way to fix it? Well, then there is Zblj's Fox 8x8x8. Yes, it has 8 XL-motor. Prior building Fox I had some experience with 9398 Crawler and poor knowledge of XL-motors (mocing didn't go well). So I was wondering how could Fox handle 8! motors at the same time. Turned out pretty well, exceptionally well, I'd say. Not a single damaged or broken part, despite crawling and going over unimaginable obstacles. There are less gears as motors are "attached" to wheels and model also is quite heavy, which I think is advantage here - better grip and XL-motor power utilization. So from this experience I'd say XL-motors need to be as near as possible to tyre in order to unleash its full potential. 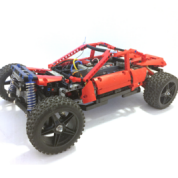 Since you are using rigid axles it shouldn't be that hard to change it to 1 motor per wheel. I see you use 3rd party tyres. How big are they in diameter? XL motor is definitely not weak It will destroy parts easily in high-torque situations: split gears, twisted axles, shattered liftarms. Very good point, however, crawlers and tatras or tatra-like, long vehicles are totally different IMO. Apples and oranges. ZBLJ's Fox, as you pointed out has many more wheels to dispurse the power, but more importantly, they just travel different. Great for climbing near impossible surfaces to be sure, but mostly used for steep inclines, muddy, wet, or snowy terrain. They are NOT rock crawlers. If they do crawl over rocky terrain, then they use their length to almost act like a bridge to get their wheels from one point of contact to another, not to keep all wheels on the ground at all times like a crawler. Therein lies the main difference. The suspension. They don't need lots of suspension travel, like crawlers, therefore their steering, chassis, etc. can be build much stronger and they have room for additional gearing. As you can see in my crawler, the suspension has tons of travel.... but the trade-off is that is is not going to have the rigidity of a 8x8 chassis. Not that the 4 XL motors can't be done. I am not saying that.... I have seen it before. But when you do that, with Lego anyway, the motor is a direct input to each axle, therefore the motor is right there built in the chassis and you can lose precious ground clearance. The tires are 2.2 not the regular 1.9 tires used by many for Lego. I love them. I also have 1.9s, and even used them previously on this model, and the 2.2 tires work much better. I noticed how you used the 64712 wheels as rims. I've seen some people using the power puller rims with 2.2 third party tires. Do you know whether your tires would fit the large racing wheels? The tires are 2.2 not the regular 1.9 tires used by many for Lego. Noticed that. But these are bigger in diameter than any other LEGO tyre. Could be a reason there is an increased stress in transmission. Good catch, but it was actually designed that way. You can see I used a 3L bar with stud at the end. The end opposite of the stud is only a bar, and therefore fits loosely in the liftarm. The reason for the slipping is that this creates a form of clutch gear. As can be seen in the video, it turns the steering rack well against alot of force, but slips to prevent breaking the steering rack clean off. Suprisingly, even a M motor, geared down to 12/36 can create quite a bit of damage if one is not careful. This mechanism creates just enough power to turn, even in tight spaces, but doesn't damage the steering rack. The suspension didn't have any problems......and I at first tried planetary reduction.... but ended up just leaving it out. The balance between RPMs and torque is a fine one, and the increased torque of the adding the planetary system just slowed things down too much. I don't -- sorry. I don't own the PP rims.